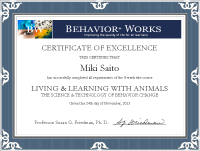 Miki Saito, CPDT-KA offers in-home private lessons for blind dogs and their owners in Yokohama and Tokyo, Japan. For more details see this website (only in Japanese). If you’d like to know more about Miki’s lesson in English, plese feel free to ask. If you’re interested in hosting a seminar with Miki Saito, CPDT-KA, please feel free to ask.